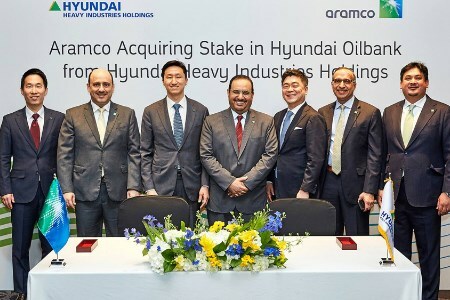 Saudi Aramco and Hyundai Heavy Industries Holdings have announced that they have reached an agreement for Saudi Aramco’s subsidiary, Aramco Overseas Company BV (AOC), to purchase a 17% stake in South Korea's Hyundai Oilbank, a subsidiary of Hyundai Heavy Industries Holdings. The investment is valued at approximately US$1.25 billion. AOC’s’s investment in Hyundai Oilbank will support Aramco’s crude oil placement strategy by providing a dedicated outlet for Arabian crude oil to South Korea. Hyundai Oilbank is a private oil refining company established in 1964. The Daesan Complex, where Hyundai Oilbank’s major facilities are located, is a fully integrated refining plant with a processing capacity of 650 000 bpd. The business portfolio of Hyundai Oilbank and its five subsidiaries includes oil refining, base oil, petrochemicals, and a network of gas stations. AOC is a subsidiary of Saudi Aramco. It provides support services to Saudi Aramco and, through its investments and joint ventures, forms a part of the global Saudi Aramco oil, gas, and chemicals enterprise.